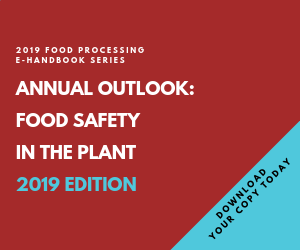 The safety of our food supply still weighs heavily on the minds of most industry professionals, according to FOOD PROCESSING'S 2003 Manufacturing Survey. As with past manufacturing surveys, we queried thousands of professionals about the issues they believed would be most crucial in the coming year. The industry responded loudly and clearly: food safety is key. In fact, a full 50 percent of respondents rated food safety as their most important concern, making it far and away the survey's top-scoring issue. Despite the year-and-a-half that has passed since Sept. 11th, concern over the matter is apparently growing, since "food safety" was cited by more respondents this year than last. Moreover, 64 percent of respondents indicated their companies have either implemented new food safety and sanitation initiatives or intend to do so. "Food safety is still on everyone's mind," says Wesley E. George, III, automation engineer for brewer SABMiller, Milwaukee. "The threat of bioterrorism and food safety are still our main two concerns," agrees Jim DeRose, director of manufacturing for Smart and Final, Inc., a Los Angeles-based foodservice and grocery concern. While the two issues have always been considered important, "it still makes good business sense to keep [working] on them," DeRose says. Although plans for other capital expenditures , including those for automation and machinery , have downshifted to a wait-and-see mode, expenditures for food safety and plant security have remained largely intact. Still, budget constraints are sidelining some planned measures and, as a result, companies are calling upon employees to develop less costly solutions. As DeRose notes, "we've become a lot more creative" with regard to safety initiatives. Some of the focus is on the fundamentals, with some 84 percent of respondents indicating their companies will address food safety with employee training. Another 73 percent said their companies have plans to tweak or implement HACCP plans. Meanwhile, 60 percent of respondents said their companies plan to improve pest control, while 55 percent said plans to augment sanitation equipment are underway or completed. Among the plethora of specific safety initiatives cited were improved E. coli testing, stronger biosecurity measures (i.e. locking of milk tankers), audits, access restrictions and, in many instances, plans to place more stringent demands on suppliers. In all, only 22 percent of respondents indicated their companies had no plans to improve food safety this year. As a result of last year's terrorist attacks, food safety developed a dual focus that places plant security (aka food security) more squarely in the overall food safety program. Food security, in its genesis, has not only come to encompass the threat of bacterial contamination, but also the threat of madmen and malcontents bent on tampering with the food supply. In last year's report, 78 percent of respondents indicated their companies were intent on better securing the facility. This year, despite a rash of budget cutbacks, 65 percent said their companies would be doing the same. The majority (61 percent) said they'll concentrate on physical improvements. "We had plant security projects in place before the economy went south," says George. "and those are still moving forward." Options for battening down the plant include better lighting, restricted access points, fencing and alarms. For 51 percent, security improvements will come by way of surveillance initiatives, and 47 percent have beefed-up employee identification efforts with background checks or passes. Software improvements or installations will play a role for 15 percent of security initiatives. Twenty-two percent of respondents said they plant to outsource their security efforts. Last year, "labor and human services" ranked as the second most important issue among survey respondents. It occupies the same lofty berth this year -- twice. We broke the issue into two categories for the 2003 survey: "Labor" (training, cost reductions, etc.) and "Resources" (recruiting/retention), which 34 percent and 32 percent of respondents, respectively, ranked as number 2 among all issues. Both issues seem to be on everyone's mind, at least on some level, since less than 1 percent of respondents ranked them last. Interestingly, only 15 percent of respondents consider automation a top issue for the coming year. Most (22 percent) placed it in the middle of the pack, and nearly 30 percent listed it near the bottom of their concerns. It may be that the issue has lost some of its urgency, considering, for instance, that 51 percent of respondents have packaging lines that are already automated. "I think we've hit a plateau," says George. "There was a tremendous amount of automation implemented over the last 10 years because automation technology was growing by leaps and bounds." Much of the PLC to PC assimilation has settled and companies are less intent on reaching the next level. MRO is another enterprise that appears to be going smoothly -- or at least hasn't been very troubling. Less than 1 percent of respondents cited it as a top concern, and the bulk of them placed it third or fourth among various concerns. In fact, 60 percent of respondents said their companies weren't planning to do much differently by way of MRO this year. Despite a spotty history of exorbitant fees and coastal blackouts, energy seemed only moderately disconcerting to respondents, with a mere 19 percent of them ranking it as their top concern (though another19 percent ranked it as their number 2 concern). Perhaps the ball is already rolling: Last year, nearly 75 percent of respondents were taking steps to improve energy conservation, while 61 percent of this years' respondents were doing the same. However, 22 percent this year said their companies were not taking any "aggressive" measures to address energy consumption. Very few were attempting co-generation, a solution that two years ago many experts predicted would be the next big thing for production facilities. "HACCP training and implementation of date/lot/batch coding, metal detection and x-ray machines"
"Process Control and Plant Improvements/Training"
"Locking of milk tankers, bio-security in place, metal detectors, x-ray, etc." "Increasing production line sampling and improved clean-out procedures." "Reviewing all current procedures, addressing issues we see as potential risks". "Implementing security and training employees"
"Intervention processes for carcass beef, e-coli test & hold programs"